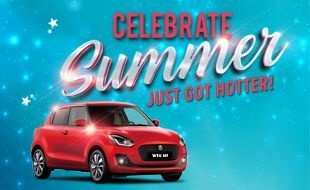 Home What's On Celebrate Summer – Just Got Hotter! Summer at Silverstar has just got hotter, Celebrate Summer has been extended until 30 March. Come play Slots and Tables to stand a chance to win a CAR & CASH! We have over 300 mystery cash prizes to be won. Stand in line to win in our sizzling hot Tuesday & Wednesday Mystery Activations, Saturday Rewards Draws & finally the Car draw. Any person who has been issued with a Refusal of Entry order, or who is self-excluded, or who falls into any category of excluded persons, is expressly prohibited from participating in this promotion. This promotion is open to Gold, Platinum and Black Silverstar Rewards cardholders. Entries cannot be purchased for cash, through any other form of consideration only points earned during the promotional period will be considered (05 to 30 March 2019) the more points you earn, the more tickets you get! There is no limit to the amount of tickets you can earn. Participants earn points by playing Slots or Tables whilst using their Silverstar Rewards card. Qualifiers may not be drawn more than once per draw, a redraw will be done should the same finalist be drawn on the draw. All Participants are required to be present at the draws on the respective dates/times to be eligible for a Prize: Provided that if a participant elects not to be present in person when the winner/s are announced, the participant may nominate another person who has been duly authorised in writing to attend the draw on behalf of a participant in the form and manner determined by management, the details of which will be available at the Customer Services Desk. Prescribed proxy nomination forms will be available for this purpose from 08h00 on the day of the draw until 15 minutes before the start of the draw for which the proxy is to be nominated. Proxy nomination forms will be available at the Customer Services Desk. Prize winners or nominated Proxies who are present will be given 90 seconds to present themselves and must be in possession of evidence of the winning ticket belonging to the winner and; positive and acceptable form of identification. Patron Manager System may also be used to verify participants’ identification. Winners shall provide a copy of their Nominee’s positive and acceptable form of identification and any other details as required by Silverstar Casino. Specifically, the onus to ensure that Nominees are present for the above purposes shall rest solely with the finalist concerned. In instances where only one eligible finalist is not present, the last draw mechanism, podium, box or similar device will be issued to this finalist by default of the other finalists choosing their draw mechanisms, podiums, boxes or similar devices. Persons acting on behalf of eligible finalists must acknowledge that he or she is merely acting on behalf of eligible finalist and that he or she is not entitled to prizes and benefits awarded to finalists or prize winners. Should a prize winner who is eligible for a prize but who is not present as a result of declining an invite to be present for the draw, then nominate a representative, the Casino shall take all reasonable steps to contact the prize winner via the contact details provided in the register or otherwise readily available. In such circumstances the prize winner may claim the prize within 15 days from the day of the draw at the casino.